Hey folks! Today we want to show you some preview screenshots of the upcoming update. 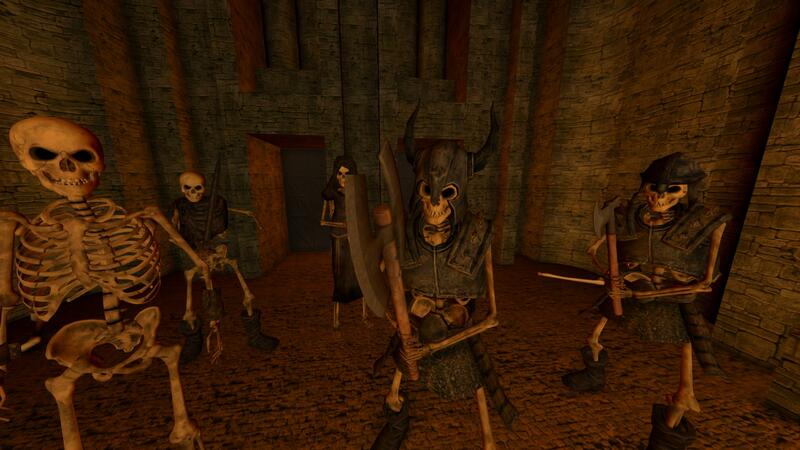 It will introduce some hostile npcs, including groups of hostile bandits roaming the forests during night and also skeleton warriors guarding the dungeons. You will still be safe when staying home, but you have to be careful when exploring the world. Of course there will be also an option to disable hostile npcs when creating a world. 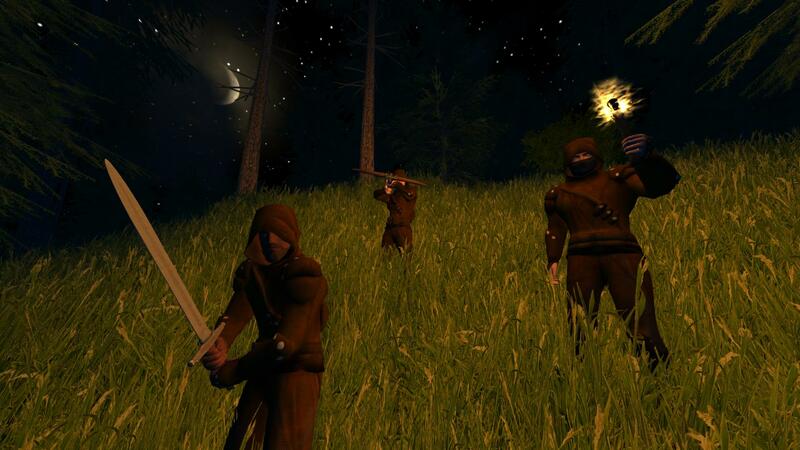 On the other hand, the update will also improve the npc AI as well as the collision detection. As a result, animals should no longer be able to walk through walls. Last but not least we're also expanding the plugin API, so it will be possible to create custom items (tools, weapons etc) for Rising World. We will prepare an example plugin which offers an easy way to load custom items into the game. Unfortunately we have no ETA for the update yet. We try to get it ready as soon as possible, but recently there were some unexpected changes introduced to Steam which have a big impact on Rising World and its future development. We can't say much about these changes yet, but we will definitely keep you informed about the current status. will there be a way to easily populate areas that have been hunted out on the servers? Setting NPC by hand is tedious at best. Same question that I guess has been answered, yet wanting to know if they'll be in older chunks as well. If not, I guess we'll have to make our own bandit camps for them to wander out on their own. Also, awesome on the hostile NPCs. Happy about it that I can't wait for them to spice things up. I however feel bad to those that shall filter the NPCs out, yet happy we have the feature to do so. Half the game would be gone for them, but if they want to play that way I guess that's fine. Lastly, because of the skeletons. I also hope Steam sorts their idiocy out because indie developers are the ones keeping the whole VR market afloat as well, not just the gaming market, that I do hope Steam fixes that. Everything AAA games refuse to do the indie developers end up doing with little to no complaints. The post was edited 1 time, last by ArcticuKitsu ( Dec 12th 2018, 12:26am ). Did he just say custom weapons? Umm.. somebody get on that missile launcher, please? Let's start porting weapons from all the games and calling the nexus. Would love to see this game on the Vortex Launcher by Nexus Mods #Hype So let me get this straight we can now make fully customizable weapons right? Does this mean we can possibly add fully customizable NPC's to the game (Models) "example: Dinosaurs, Super Mutants, Aliens... etc?" I realize we wouldn't be able to make custom armor pieces just yet because of limitations but I do know a couple mod authors on the Nexus I am friends with. Mostly everything we see here are plugins two very good ones are planks n' beams and animal breeder master but if we can bring cats, dogs and other variable npc's to the game by manipulating models and adding sound effect files for them it would make an excellent addition. How far off are we from achieving that? The post was edited 1 time, last by ArcaneDesmond ( Dec 12th 2018, 12:01am ). Took me hours to find iron ore on my last start up, maybe a faster way some how still pretty new to the game. Maybe we will also add a command to force respawn animals/npcs. We will at least offer an example plugin which loads custom items automatically without having to write a single line of code. You just have to put the item files (model, texture, additional data) into a subfolder in the plugin folder, and the plugin will do the rest. Umm.. somebody get on that missile launcher, please? So let me get this straight we can now make fully customizable weapons right? Basically yes, although there will be some limitations. You can't add custom animations yet, this means you can only use the animations which are already in the game (but that should be sufficient for most types of items). How far off are we from achieving that? I might have somewhat of a silly question but how hard are these bandits going to be to kill? Hehe, well this is indeed something we have to take into consideration Maybe we will prevent them from spawning during the first nights when playing on a new world. This makes me happy you're looking into this because places then became deserted. This shall probably once again make me want to play with Animal Breed Master again that I can't wait. Awesome! Hope it all works out that I wish you the best. Rising World honestly needs even the things your trying to get ready in time for the update. Excellent! I can't wait to check out the example because I apparently need the 'Book for dummies' edition of it so I can understand what the hell is going on. I stalled out on music that I can't wait to play with this enforce. Can you please go back and make a 'Music API Tutorial: For dummies' as well? A new thought came to my mind is if we can also have these items also behave as crafting benches/furniture/storage containers so once we place them down they can stay in place as we specified them to? It would work better than the 'Staticmodels' plugin that I struggled with because of the whole .pmx file format thing. Maybe I'll still have trouble with it, who knows. I can ask around now thanks to VRchat side of things having borrowed models uploaded. Guess I'll just wait and see that I'm probably being far too curious than needed. I guess we'll figure this all out when it releases? Doesn't hurt to ask now though. Maybe. If bandits spawn only in unmodified chunks, will they remain in this chunk or will they walk away from it, also into modified chunks? And how far off their original spawn place will they move? Will they roam randomly or go for specific chunks (i. E. Most blocks)? Yeah, if it becomes too much of an issue having a Patreon account should help you (red51) out, unless that's a touchy thing in Germany or something. When push comes to shove something has to be done that we wouldn't mind helping you out Patreon wise. You could even post renders on higher tiers, or whatever you desire. Up to you. Even though I'm replying to agiser I'm aiming this at Red51 because I agree with agiser. Rising World seems to still be doing better off that it's getting 65 article likes on Steam while CyubeVR is getting around a single digit likes on articles that I feel bad for any developer still making ground on their game. Word of mouth is going to have to be stronger. It's also because of corporation greed that people shifted from Youtube to Twitch yet it's still bad. I wonder if Vimeo is a proper replacement for YOutube that we should colonize Vimeo for our Rising World fun. Wow, something reminded Oblivion) It would not be bad to see the settlements and villages of the NPS, where you could trade with them, complete quests for protection from bandits and so on. It would be nice if they could add the ability to add their music / sounds to the game. I also probably ask for the second time, but add a prone position. That's my new desktop background! I stalled out on music that I can't wait to play with this enforce. Can you please go back and make a 'Music API Tutorial: For dummies' as well? A new thought came to my mind is if we can also have these items also behave as crafting benches/furniture/storage containers so once we place them down they can stay in place as we specified them to? Yes and no^^ Custom items will be stored permanently in the world database (once they're added to a player inventory or the world). Every item is identified by a unique hash which is set by the plugin creator. I dont mean, that only patrons have influence to development. I mean, that only one time in a year the patrons have more influence through one vote. If you give the different options, the voting is based on your and community wishes. Alright, so you said player inventory. If I want to dedicate a storage container to contain these modded items I do hope I'm able to do that as well. Can't wait to try it out though so I can finally mod something in weapon side at the very least. I at the very least hope for multiplayer side that it all syncs with players joining so there's no client miss-matching, and such. I'll also just take a "wait and see" approach that we'll just see when you release it. Well, if the game really is in danger I'm sure 99% of the people should hopefully understand the situation Steam placed you and other developers in. It seems fair to me seeing how +18 games also require Patreon to stay afloat that you can simply state "development costs" while not being far from the truth, right? Well, you can do a poll then we can see from there if we're still uncertain about this. I've brought up Patreon before that people simply want things to be free yet you need money to live somehow, people should understand where you're coming from. We live in a heavy monetized world which is nuts.